Cork had the English Market. Galway has the Galway Market. What will Dublin have? These two markets so far have been treasures within the two main cities we’ve stayed in during our summer abroad in Ireland. They’ve both been around for hundreds of years, and though many tourists do walk through, they’re still a source of shopping for many locals. I’m writing my final feature story about the Galway Market (hopefully I can stretch it to five pages), after spending time there both Saturday and Sunday. 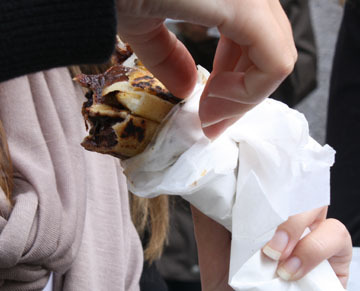 Chocolate melts down our fingers, leaking out of the crinkly translucent white paper wrapping the crepe. Not too bitter or too sweet, the Belgian milk chocolate chips had been the right choice, balanced by an extra sweetness from the caramelized banana. The slices stuck out from the top, covered in a slightly crisp sugar coating created by sautéing the fruit on the hot crepe plate. Just a drizzle of Bailey’s Irish Cream mixes its creaminess with the melted goodness. The actual organic crepe itself is a dark brown, like a burnt pancake, but it has been pre-made by the crepe master, giving it a sturdier hold than a crepe made on-the-spot. Oh, the crepe. It instantly vanished the rain from the marketplace, giving us our own sun as Ryann and I stood at the corner of the street, taking turns holding the triangular treat, biting into the corner. Back and forth we went, savoring each bite as the flavors melt on our tongues. It had been raining hard all morning Saturday. But with just 11 days in the city, every one was valuable to me; we weren’t going to get rain get in the way of further exploration. We’d walked up and down Shop Street and the Latin Quarter several times in the past few days, leaving each shop with yet another bag, or taking more photos of the street performers, if they’d let us. Today, colorful tent coverings stood along one of the side streets, beckoning us to investigate. We talked to the painter who displayed his pieces and prints by others in simply painted wood frames. The blues, purples, and reds stained our fingers as we picked each up to admire. Purchases wrapped in plastic and tucked into our bags, we continued to look at the fruits and vegetables, the fairy shoes, the jewelry, the cheese. Then, the crepes. Ryann and I knew when we saw the yellow cart painted with a giant red “Yummy Crepes” sign above that we’d have to get at least one, if not more. 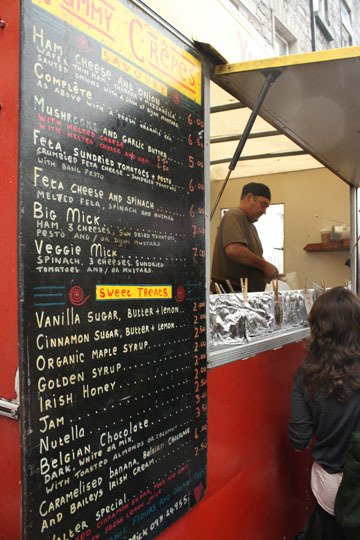 The sign lists the savoury — ham and cheese; mushrooms and garlic butter; feta, sundried tomatoes and pesto; “big mick” and “veggie mick.” Sweet treats follow: vanilla sugar or cinnamon with butter and lemon, maple syrup, jam, Nutella, the Walter special. I’ve had many crepes before, both homemade and from cafes. They’re such a simple concept, but so satisfying. My first “real” crepe though was in Paris, home of the crepe. My friend and I had left the majority of the group as they shopped along the Champs-Elysées, and we took the subway to the Sacré-Coeur Basilica. Our teacher had told us that we would find the best view of the city at the top of the steps. Up and up we climbed towards the crystal white church that glimmered in the spring sun. We could see for miles and miles of the city’s neverending skyline, and sat on the stairs among couples and groups of students enjoying the heat. Exploring the street below we found a corner creperie. Maggie and I — both chocoholics — had to order the Nutella crepe. I remember standing on the corner with the biggest smiles on our face as devoured our treats, though we had meant to savor each bite. Closer to home though you can find another creperie: The Flat in Charlottesville. While touring UVA with a friend, she took my family to the Downtown Mall for this hole-in-the-wall stand. Just two long benches sit in front of the small shop. But the flavors that came from the inside made up for the lack of seats. I don’t recall which flavor I ordered that day — probably Nutella though — but I do remember it being the perfect cap for our trip. In front of the cart, Ryann and I discussed which treat to order. No one was in line, and we started talking to the crepe master, Michael. He flipped over a triangle on one of the hot round frying pans, and cheese sizzled out from the edge. Ham peeked from the edge and the soon-to-be owner gazed lovingly at his lunch cooking. But we wanted sweet on this dreary afternoon, something to take our minds off our shoes that couldn’t soak up anymore water. “Oh, you just won’t be able to share that,” Michael said as we ordered the chocolate, banana and Bailey’s crepe. With wallets much thinner than we would have liked, we decided to make do with one crepe. We could always come back to order another. “They’re good hot or cold. So you could take some home for later,” Michael added. As he sliced a banana onto the pan, Michael told us he learned how to make crepes in Paris years and years ago. Before coming to the Galway Market where he only works on the weekends, he and his wife had sold crepes in Cork’s English Market for two years. We told him we were from America, and he recounted a spell that he lived in Boston. The bananas were turning a golden brown now, and he flipped them over while putting the pre-made crepe on the other burner to heat it. He sprinkled Belgian milk chocolate chips across half, letting them slightly melt before transferring the bananas on top. Taking just a step back in this small cart, he reached for a bottle of Bailey’s and drizzled just a thin line in a zigzag. He wrapped the whole creation into a triangle and protected it with the paper for us to hold. This looked like heaven, and we smiled at each other this whole time. “Take some napkins,” he said, tearing them off the roll. “Here, you’ll need some more.” After saying goodbye, we walked down the market to find and open spot to stand. I took a bite, and all the sweet flavors melded in my mouth. Ryann did the same. In the corner of my eye, I saw the donut maker who stood in his stall across from us smile. Families walked by, children asking for their own treats. And bite by bite, smile by smile, we finished the crepe.